Sun., July 29, 2018, 8 a.m.
A. 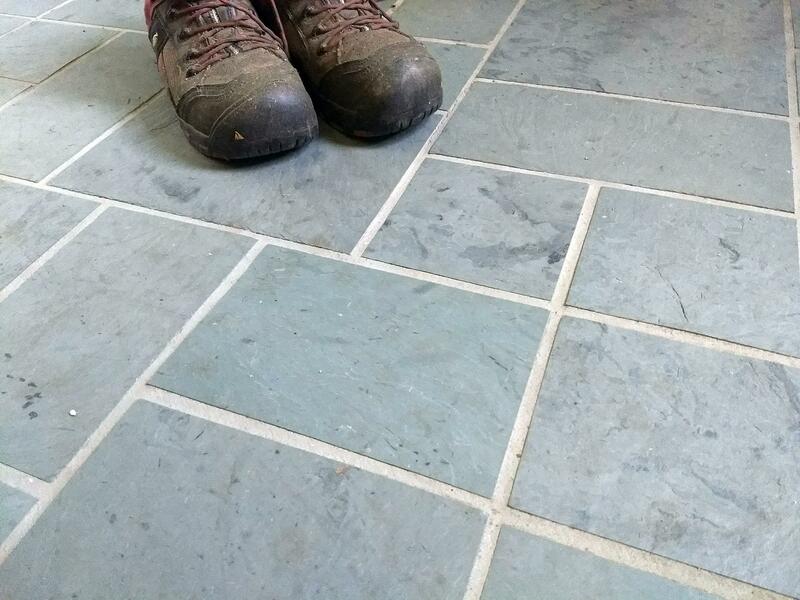 There are many reasons why you might want to change the color of the tile grout. Fortunately, you can do this, but you need to realize there are scam products out there. I’ve changed the color of grout before, and it’s not easy. The color of the grout between the pieces of real slate in the entrance hall of my last home was supposed to be black. However, it came out a mottled dark gray because I foolishly added a grout additive to the mix. My wife hated the ugly appearance. I discovered there are liquid grout stains that are just like penetrating wood stains. Using an expensive small square-tipped artist’s brush, I slowly applied the rich black stain to the grout lines. It took weeks of time doing this at night after I had come back from building homes all day. Some products claim to be grout stains but are really just paint. Avoid them. Do NOT paint your grout. Keep in mind that you can really only go from light to dark when changing color. It’s virtually impossible to find a penetrating stain that will transform dark grout to a light color. If you put a form-filming paint on your grout, I guarantee you it will peel. Be sure the grout is perfectly clean BEFORE you start the process. I’ve got videos and extra tips for changing grout color at my website: http://go.askthebuilder.com /groutcolor. Q. Tim, I desperately need your help. My concrete sidewalk and driveway are falling apart. The top surface is crumbling, yet just below the surface the concrete is as solid as rock. It’s only a few years old. What’s causing this? Contractors have told me I need to tear it all out and start over. I can’t afford this. Is there a DIY solution or a far less expensive alternative that a handyman can do? I’m looking for a repair that will stand the test of time. – Mona G., Lexington, Ky.
A. Crumbling concrete is very common. You may have it on your driveway, patio, outdoor steps or even a retaining wall. The great news is you can often repair this yourself with minimal expense and tools. There are lots of reasons why concrete spalls. Spalling is when the top surface of concrete flakes off or crumbles. In many instances, it’s traceable to workmanship errors: the concrete finisher added extra water to the concrete while putting the final finish on or started finishing the concrete while bleed water was still up on the surface. Mixing extra water with the concrete dilutes the amount of Portland cement in the upper surface. It’s important to realize that the cement is the only component holding the sand and gravel together. If you have too little cement, the concrete can’t withstand freezing and thawing cycles and heavy use. More Portland cement in concrete is always better. This is why the concrete abutments on railroad bridges last for over a hundred years. The railroad owners only wanted to build the bridges once, so they made sure the concrete mix had extra Portland cement added. You can repair your concrete by installing a thin overlay on top of the old concrete. There are several important steps, but they’re all easy. The first thing is to remove all of the crumbling surface concrete. A pressure washer wand held at a low angle is perfect for this job. Remove all the old failing concrete until you get to solid material. A concrete overlay can be as thin as 1/16 inch or as thick as several inches. Another key point is the size of the stone or aggregate in the overlay mixture. The size of the largest stones in the mix can never exceed 1/3 the total thickness of the overlay. For example, if you’re going to add a 1/2-inch overlay, be sure the size of the largest stones in the mix is not much larger than 1/8 inch. You need a blend of stones and sand in the mix with some of the sand being extremely small. Silica sand is the strongest sand you can use, and I’d suggest you buy a bag of it to include in your overlay mixture. The secret step of the process is cement paint. This nearly forgotten trick ensures the new overlay bonds permanently to the old concrete. Cement paint is made blending cold water with pure Portland cement until it resembles latex paint. You brush this onto the damp old concrete one minute before you apply the concrete overlay. Tim Carter can call you on the phone for free to solve your problem. Go to his website and fill out the form on this page: https://www.askthebuilder. com/ask-tim/. Published: July 29, 2018, 8 a.m.